If you’re here for the first time, welcome! I’m Jana Bek, an Ann Arbor based interior designer with an emerging lifestyle line of home décor, textiles, & lighting. I have a love for bright colors, bold prints, and designing spaces & home décor that help transport you to your dream destination. 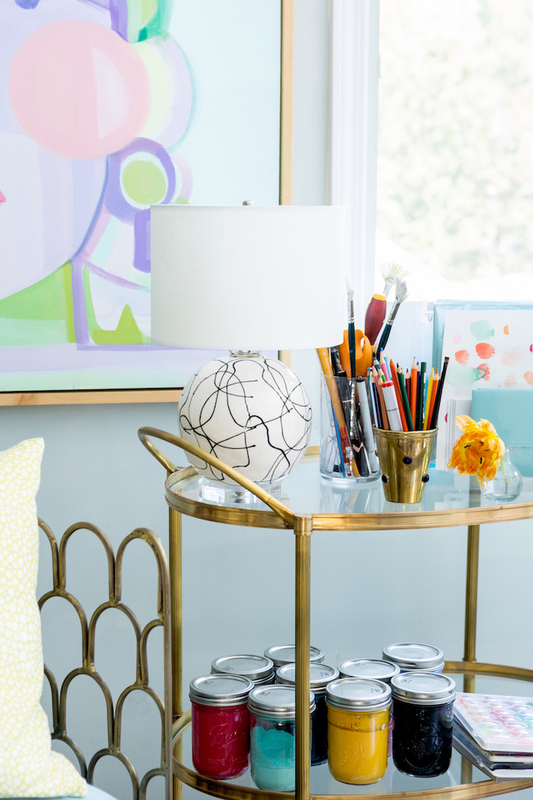 I’m so excited to be participating in my sixth season of One Room Challenge! This season I’ve decided to makeover our guest bedroom. It’s always been the room that inherits leftover furniture and decor so it has zero sense of design. Our most frequent visitors tend to be nephews and nieces, and one of their favorite activities is to people watch and skate at our local skate park so a relaxed, cool vibe is inspiring the look. I’ve found a lot of inspiration in Nina Freudenberger's Surf Shack, and I know I’m incorporating this awesome Artfully Walls piece, Boy’s on Skates, into the design. I want the room to be a little offbeat & funky, but still pulled together. I’m a little worried it may look contrived, so wish me luck. I’ll be in San Fran next week for an exciting designer retreat so I’ve got to kick my planning into high gear! Come back next Wednesday for updates, and In the interim, you can find my scheming on Instagram & pinterest. We are thrilled to announce two amazing collaborations that are launching this weekend at High Point! Fresh for spring, the tropical & travel inspired patterns are printed on everything from luxurious linen to perennial poly, ready for outdoor entertaining (and sturdy indoor upholstery)! In six stunning arrangements we our pairing their life-like florals with our signature brushstroke ginger jars. From Cherry Blossoms to Olive Branches, there is the perfect arrangement to add fuss-free fauna to your home! (Seriously, you have to touch them to realize they are faux)! We invite you to view the collections & meet Jana this Sunday at High Point, details for each event below! I’ve never been one to edit our decor for the seasons, but this year we decided to have a huge holiday party & I wanted our home to relay a festive vibe that invites guests to stay awhile. In tweaking our spaces, I arrived at three top takeaways to get your home holiday-ready without completely overhauling every detail. Here's my first tip & I'm excited to be sharing all of them over at Style Me Pretty Living today! Given our homes coastal vibe, I wanted the greenery to be a bit softer. As our local Michigan options are heartier, I took the task to Etsy. In doing so, I sourced this gorgeous (looking and smelling) bay wreath. Then, I’ve always wanted to work with magnolia, and thankfully my go-to florist, at the University Flower Shop, was able to source it for me. I so enjoy that both the bay wreath, and magnolia branches, are drying now but are still so pretty. Get the rest of my tips over at Style Me Pretty Living, I hope they resonate with you! This summer we partnered with Frontgate to refresh our poolside patio and I'm excited to share the transformation with you! We’ve enjoyed our Carlisle outdoor furniture for almost ten years. To that end, I must highlight that Frontgate's quality and customer service, is absolutely top notch. The level of detail they consider when crafting their products is evident. From the prints lining up on the cushion ties, to the furniture still looking beautiful after withstanding a decade of Michigan elements, when you purchase FG furniture, you can relax in knowing that the pieces are as durable as they are easy on the eyes. So while the pieces themselves were still in fine form, our original yellow and green color scheme was feeling a bit tired. Coupled with the need for new barstools, our outdoor area was begging for a new lease on life! To create our outdoor oasis, we went for a classic navy & white resort vibe. I’m so happy with the crisp stripes and in knowing this timeless design will always feel fresh! For the full reveal, and my top tips to entertain with ease outdoors, head on over to Frontgate’s blog!